Work for brick and mortar transcription companies. Work from home for online transcription companies worldwide. Become a virtual-transcriptionist for users worldwide. Many clients want to hire transcriptionists as independent contractors (IC) and pay by performance. It could be a work-from-home scenario or at a client’s location. As an independent contractor, you could be transcribing webinars, commencement addresses, financial forecasts/quarterly reports, for focus groups, educational reform or health care access, TV shows interviews about NGO work, or just about anything. There are brick and mortar transcription companies looking for general transcriptionists. A job that pays an hourly wage will be available based on your typing speed and accuracy. These companies usually test for speed and accuracy before hiring. A new transcriptionist beginning their transcription career may have a better shot at finding transcription work as an IC transcriptionist at an online transcription company. These are typically work-from-home jobs, where companies pay by performance. Most successful online transcription companies are always looking for qualified transcriptionists. Transcriptionists will typically need to take their test, and pass it, to get work from online transcription companies. A good portion of transcription customers prefer to work with one transcriptionist, instead of dealing with a company, so the transcriptionist gets used to their style and special requirements. Chances of getting a Virtual Transcriptionist job for a career in transcription will increase dramatically if a transcriptionist can also provide Virtual Assistant services to their client. Starting your own transcription business requires juggling several tasks at a time. It requires a business plan, a website, internet and offline marketing, actual execution of work, and perhaps a need to hire qualified transcriptionists depending on how much you want your business to grow. A computer with a printer. A comfortable space for working. Speakers or high-quality headphones. We suggest headphones as it does not disturb other people. Microsoft Word and Microsoft Excel software. MS Outlook is desired for communication with clients and for setting alerts about the impending deadlines of projects. Transcription software such as FTW Transcriber or Express Scribe is needed to play the recordings for transcription and are compatible with other transcription equipment. High-Speed Internet Access to upload and download files. There are several questions that transcriptionists often ask us about careers. We have compiled a list. Should I work for a transcription company or work for my own clients? Can someone start a transcription company that employs other transcriptionists? Some FREE advice and a few words of wisdom. Interested in Improving Your Transcription Speed and Proficiency? 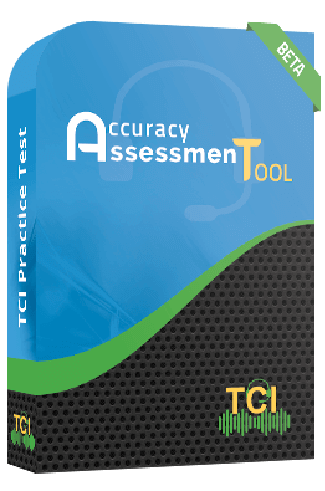 Sign up for our Accuracy Assessment Tool and get instant accuracy score for free. Enroll in our General Transcription Training Course and become a professional transcriptionist.